Fiber Flux: Free Crochet Pattern...Glass Bauble Necklace! 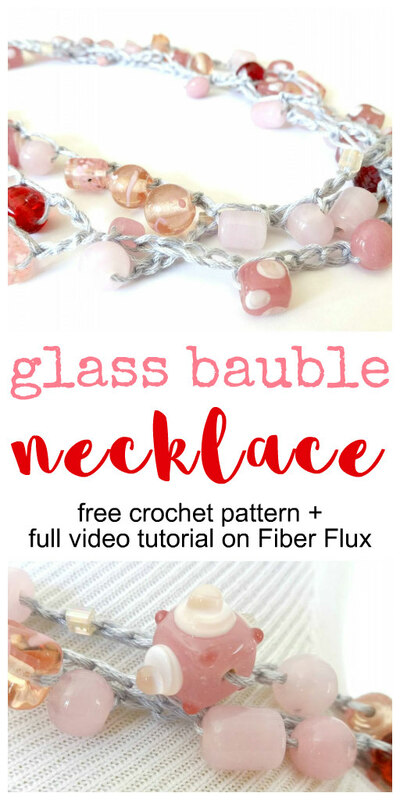 Free Crochet Pattern...Glass Bauble Necklace! 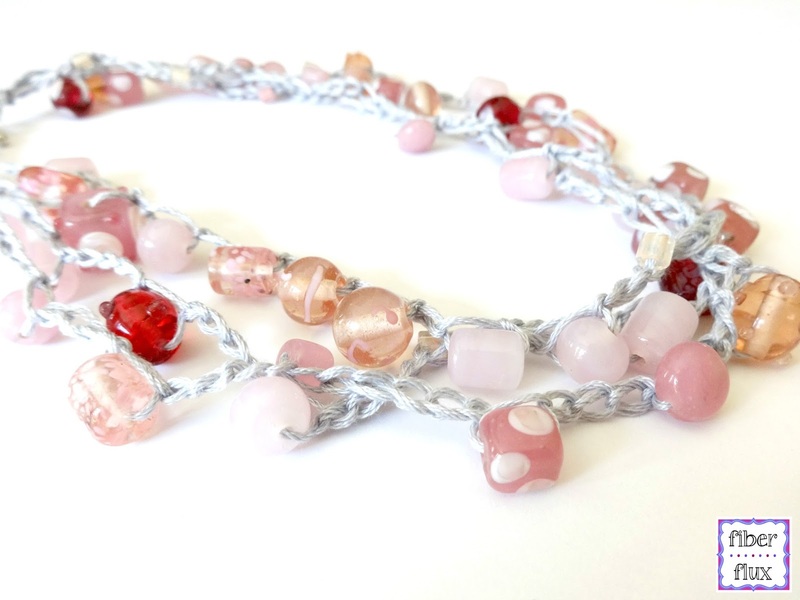 The Glass Bauble is a beautiful and elegant necklace that is very easy to crochet. Silvery embroidery floss has a soft metal look and showcases the gorgeous glass beads. 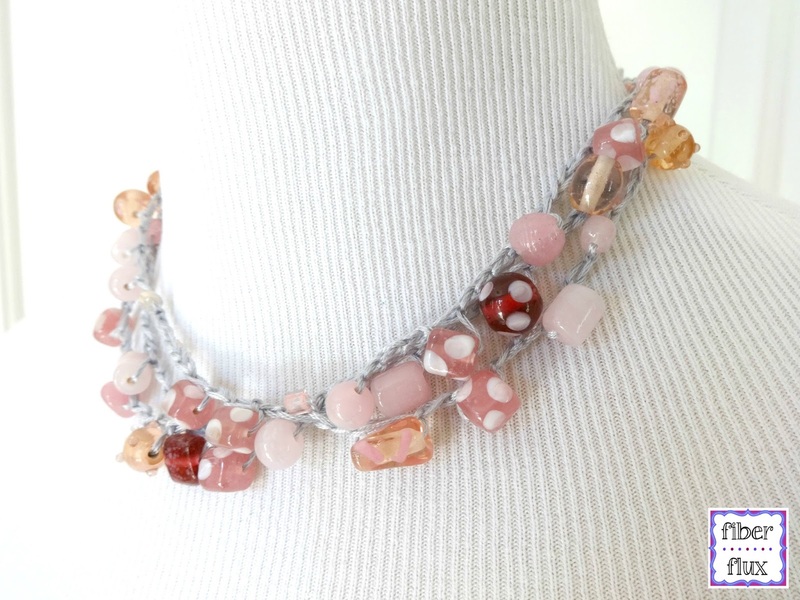 This necklace makes a great gift and is super quick to whip up! Necklace is shown in a 16 inch circumference, however you can make your necklace shorter/longer by simply working more chains per strand. 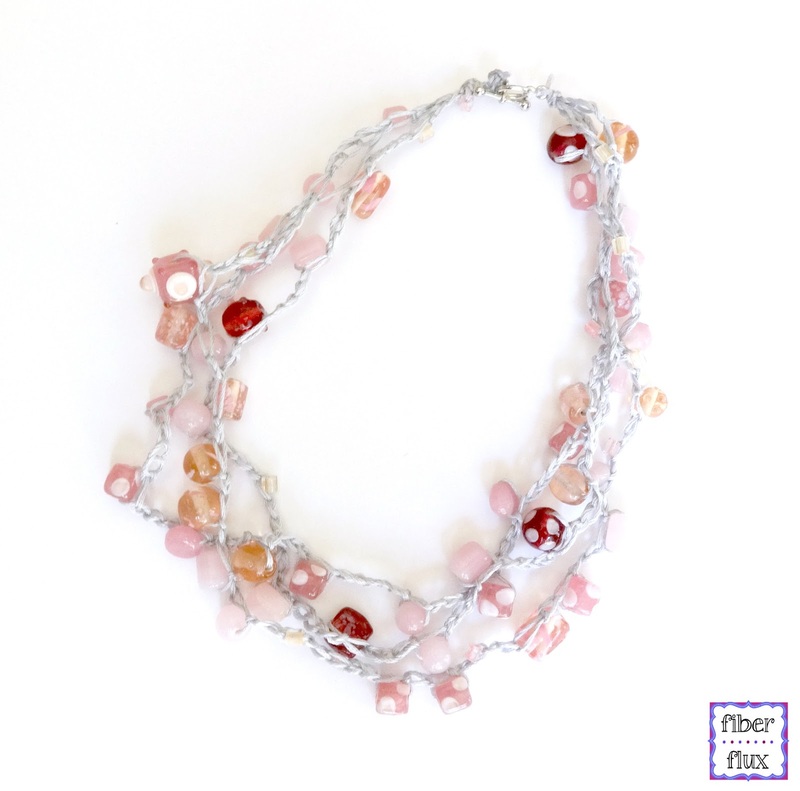 With embroidery needle, string beads onto floss and push back to allow yourself some space to work (for length shown, there are roughly about 25 beads on each strand, be sure to always add more than you think you'll need). Determine how far apart you'd like your beads to be. For two of the strands I made them 5 chains apart, for one of the strands they were 3 chains apart. With the hook, make a slip knot and make a few chains. Slide the first bead over and make a chain as usual, but also incorporating the bead. Chain a few more then add the next bead. Repeat until strand is about as long as you would like for it to be. Make a few more chains then fasten off, leaving a tail for tying onto clasp later. Repeat twice more for a total of three strands (or how many you want for your necklace). Move on to the "Finishing & Assembly" section below. Tie all three strands together at both ends. Tie each side onto clasp parts with a secure knot. Trim all tails and to ensure that the knot does not slip out you can dab a little clear nail polish right on the knot. This will prevent the satiny floss from coming apart. Let completely dry before wearing and you're finished! For more fun projects and pretty patterns, be sure to follow Fiber Flux on Google+, Facebook,Twitter, and Pinterest for the latest updates! I love this necklace. But I don't think your link for where to get supplies is working. 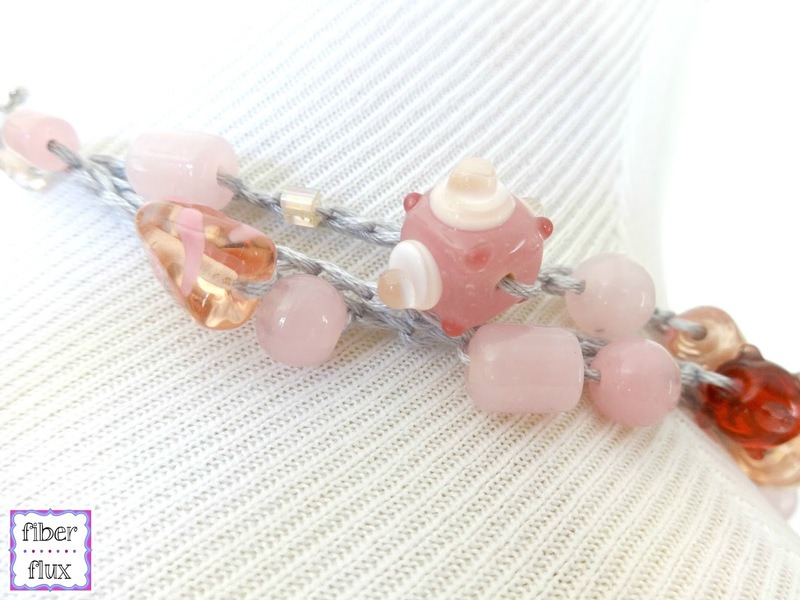 Could you please advise on where to purchase the beads online? Thanks! What size needle did you use? I have #24 needles but they won't go through many of my beads. Thanks!